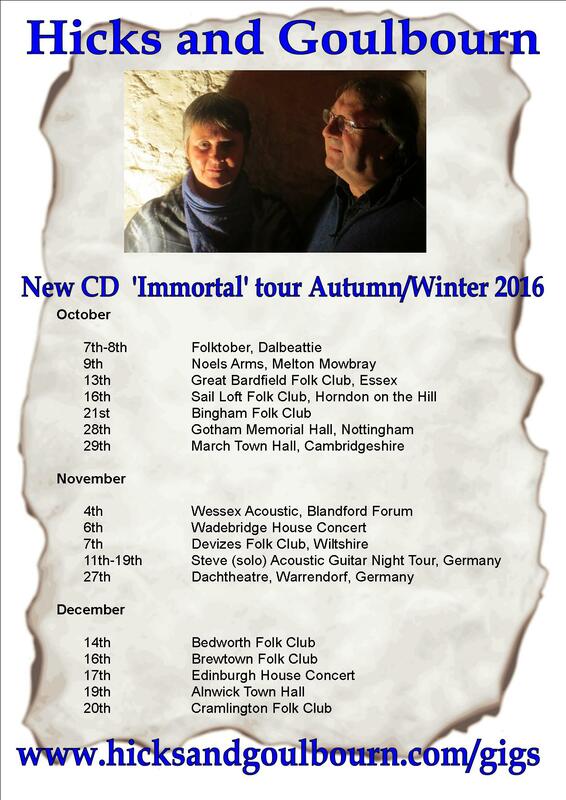 Steve and I will be promoting our new CD, ‘Immortal‘, on our Autumn/Winter 2016 tour. It would be great to see you there if you can make it and please help by spreading the word. Please note the updated list as of 5th October which includes Devizes Folk Club on the 7th November and revised dates for Steve’s solo tour with the Acoustic Guitar Night in Germany – full details of this tour are now on the Gigs page. This entry was posted in News, Uncategorized and tagged Alexa's Animals fundraiser Alnwick Town Hall, Alnwick Town Hall, Bedworth Folk Club, Brewtown Folk Club, Cramlington Folk Club, Dachtheatre, Devizes Folk Club, Fleetwood Folk and Blues Weekend, Folktober Dalbeattie, Gotham, Great Bardfield Folk Club, Hicks and Goulbourn tour dates, Immortal tour, March Town Hall, Sail Loft Folk Club, The Noels Arms, Uxbridge Folk Club, Wessex Acoustic by admin. Bookmark the permalink.